SinclairProsser Law provides estate planning and elder law services to clients in Huntingtown, MD and surrounding areas. Our legal team can assist you with all of your legal needs so you can plan ahead for incapacity, asset protection, and probate avoidance. There are many different legal tools available to you as you create a comprehensive estate plan which includes planning for incapacity and protecting your legacy for generations to come. It is essential to employ an experienced estate planning attorney familiar with the local courts and regulations to provide advice so you can make informed choices. We are here and ready to help. Huntingtown is a census designated place within the state of Maryland. As of the most recent census, the population of Huntingtown was 3,311. There is a public high school located within Huntingtown and many of the homes within this area are large estate homes clustered in attractive developments located off of Maryland Route 2/4. The median income in Huntingtown, MD is well above the national average, with media household income around $81,672 and median family income around $85,907. For those who have higher incomes, asset protection and estate planning are especially essential so you can protect your wealth and so you can explore ways to reduce the amount of money that could be lost due to estate tax and inheritance tax when you have a larger estate. Within Huntingtown, MD, approximately 4.4 percent of households are made up of seniors who are 65-years-old or older and who are living independently without other family members in their household. As you get older, you may experience effects of aging that require you to need more assistance than you did when you were younger. Many serious illnesses are also more likely to impact people who are older. This can be a challenge for seniors who are living independently in their own homes and who may not have other family members in the household that can help them to cope with the effects of old age or illness. Help securing benefits and services, including pharmacy assistance; energy assistance; Medicare Savings; and farmers’ market coupons. Assistance for the frail elderly. Caregiver support services for those who are serving as caregivers for seniors and people with disabling conditions. CREATE! For seniors, which is a program that offers service and support to seniors who have developmental disabilities. Information about nutrition programs that allow seniors to get help with food planning and to sign up for meal delivery services they may be eligible for through Meals on Wheels. These are just some of the many different kinds of benefits for which older residents of Huntingtown may be eligible. SinclairProsser Law can provide assistance to seniors and their families in exploring a wide range of different programs and can help seniors to take advantage of all possible sources of benefits including programs provide through the Veterans’ Administration for eligible former members of the military and their families. In Maryland, probate court proceedings are handled by a court called the Orphans’ Court. This court presides over the probate process after someone has passed away and presides over guardianship proceedings. SinclairProsser Law often helps clients to avoid Orphans’ Court by assisting in the creation of an estate plan that allows assets to pass outside of probate as well as incorporating an incapacity plan so guardianship isn’t necessary in cases of illness or injury. Sometimes, however, a loved one with no incapacity plan will become sick or hurt, or a loved one will pass away. When this happens, you need a strong advocate to help you through the legal proceedings you’ll face in Orphans’ Court. Our firm can help. We represent clients in guardianship proceedings as well as during the probate and/or the estate administration process. 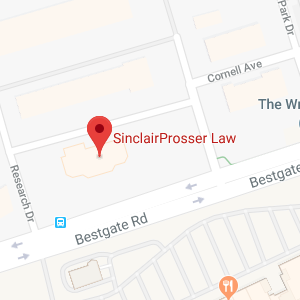 If you have any business before this court, SinclairProsser Law can provide you with representation and advice. We represent executors, personal representatives and successor trustees through the probate/estate administration process. In addition, we also represent clients during guardianship proceedings and in many other legal matters that come before the Orphans’ Court. SinclairProsser Law is a trusted firm that many clients in Huntingtown have turned to for assistance in making plans for their future. Whether you are concerned about keeping your wealth safe, preparing for illness and injury, protecting your loved ones, or doing all of these things and so much more, our legal team can equip you with the knowledge and advice you need to make the best possible choices. To find out more about the services we provide to clients in Huntingtown, Maryland, join us for a free seminar. Attendance at an estate planning seminar qualifies you for a complimentary consultation (value $350). You can also call us at 410-573-4818, 301-970-8080 or contact us online to schedule a consultation with an estate planning attorney for personalized advice on all aspects of your estate planning process.